Cape Town firms Makeka Design Lab, Stauch Vorster Architects and Van der Merwe Miszewski have made us proud by winning the international competition to design the much needed expansion to the Cape Town International Convention Centre (CTICC). The R690 million project forms part of the city’s broader plan to create a R1.4 billion rand convention precinct. The building itself fills a gap along the foreshore, long good for little but wind and parking. Building the expansion towards the Artscape and regenerating Founders’ Garden provides a unique opportunity to create an engaging cultural, retail and events edge to the city. The firms have drawn upon our unique Cape Floral Kingdom as a source of inspiration- linking the diversity of our floral kingdom to the diversity of our people. The title 6211 is drawn from the number of species in the Cape Floral Kingdom with an additional 1 added to represent humanity. Whether the proposed design will communicate a link with the Cape Floral Kingdom remains to be seen but it is fair to say that it provides a culturally neutral and rich concept from which to draw design inspiration. While linking with nature in this way in admirable one can’t help but wonder whether they missed the opportunity to connect with the nature just behind them: the ocean on the other side of the freeway. 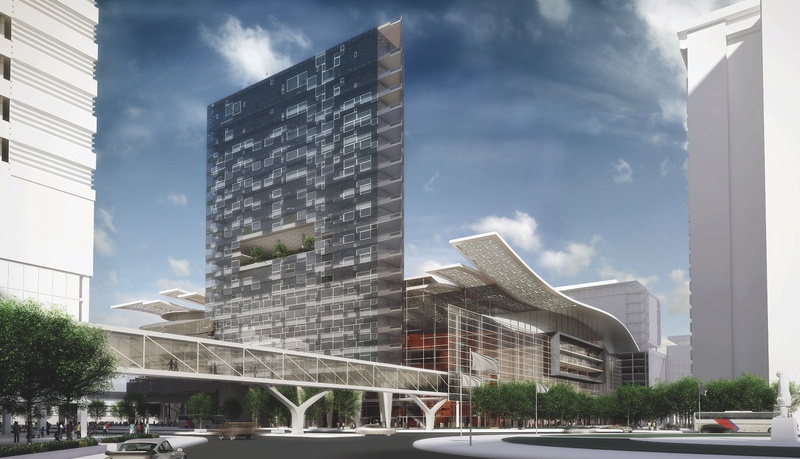 More recent plans by the City of Cape Town in fact show the proposal for a 3 storey parking building between the Foreshore Freeways to support the proposed CTICC tower. This can’t be in keeping with the calls by The Cape Town Partnership and the details in the Central City Development Strategy seeking to reconnect the CBD with the harbour and water. What does create a tangible link is the strong approach taken by the design team in targeting a 6-star green rating. With a building of this nature anything less would make for an undesirable conference venue in coming years. With the rising cost of fuel and concerns over its consumption we have to hope that it justifies the journey delegates must take to the southern tip of Africa. While the CTICC originally attempted to create a public square, it was never truly a part of the city. The conference room bridge formed a threshold that was not to be crossed by non-delegates. In building a venue which needs to serve the Convention and Exhibition industry, locally and abroad, we should not lose sight of the fact that the CTICC expansion is funded by the public. Will the new convention centre give more to the public domain than the previous? While diagrams and images of the workings of the expansion are not yet available we might hope that the building becomes a destination for all not just those attending a convention. If anyone could say “Lets meet at the convention centre and decide from there” then we would know that the building has been a success beyond ensuring income for the city and creating jobs which are also honourable indicators. We are fully confident in the skill and knowledge of the team taking on this challenge. While the formal articulation and application of the concept may be not to liking of some, these are of minor importance. Rather our concerns should be how the building contributes to the foreshore precinct and public domain as a whole. If the building becomes an island of refuge for overseas visitors and excluding of locals not directly involved then it would have missed an opportunity. If the building and precinct as a whole can link the city to the sea whilst creating a vibrant sheltered pedestrian domain which encourages a healthy street life, then we will have built a true asset to our city.